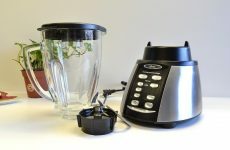 When we designed BlenderCritics, we envisioned the needs of millions who depend on a blender for mincing meat to dicing and chopping ingredients and naturally, felt that the site ought to not just educate readers on various brands but also help make this hackneyed appliance rather exciting. You will find some excellent blender recipes – fruit punches, sauces, dips, mashed servings and more. 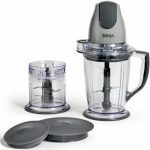 You will also find top blender brands abused, trashed and trodden over so as to provide honest and reliable blender reviews. Don’t we all love watching cooking shows on the TV? It can be one of those competitions, or just something showing a person how to whip up a fantastic sauce or a dream dessert. If you notice, all of these television cooks use some pretty amazing appliances to create masterpieces. Eventually, we want to be able to help everybody create meals that have a five star quality thanks to the ingredients blended together to bring out an amazing taste. Even if it’s just a way to give the kids a delicious frozen drink, using a blender always adds a bit of magic to the kitchen. It is important to have the right kind of equipment and at an affordable price. 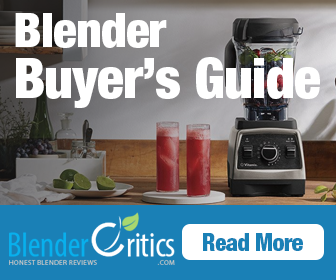 Our reviews of all the blenders give you an idea of what to expect when you purchase one. We also present a few inside stories on the manufacturers and little extras that a person can use to make tasty treats and mouthwatering dishes. You will be amazed at the types of blenders available, how affordable some of the commercial machines truly are, and what you can create with the help of a quality blender. 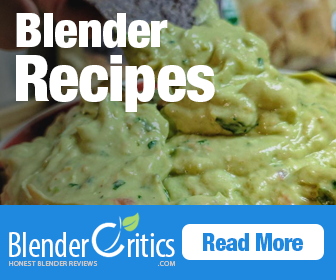 BlenderCritics.com is all about blenders, nothing more and nothing less! As you click the links, you will discover reviews, buyer’s guides, great recipes, and a whole lot more information. Whatever you want to know is just a tap of the mouse away! 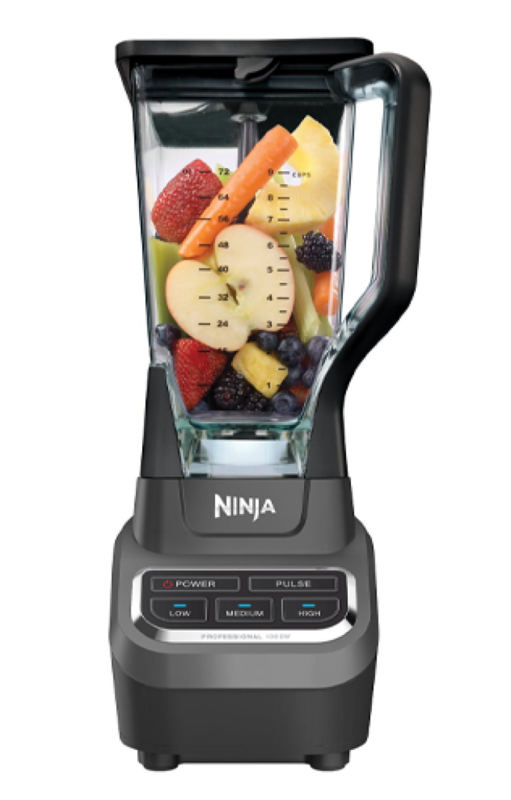 The Ninja Professional Blender is as powerful as it is versatile. 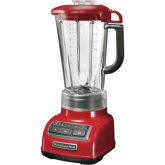 Offering 1000 watts of power behind its performance capabilities, this blender also features a very sleek design. This blender can match the décor and mood of any kitchen imaginable. 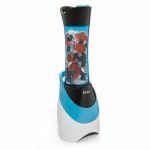 In just a matter of seconds, you will be able to make a wide range of delicious smoothies and other drinks. Utilizing the total crushing technology, you can be certain that this blender is going to be able to work its magic in hardly any time at all. The safety feature ensures that when the lid is off, the blades will not spin. 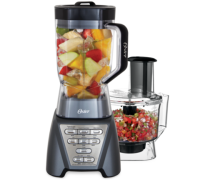 With 1000 watts of power, this Oster Reverse Crush Counterforms Blender is perfect for anyone who is truly serious about what they expect from a product like this. 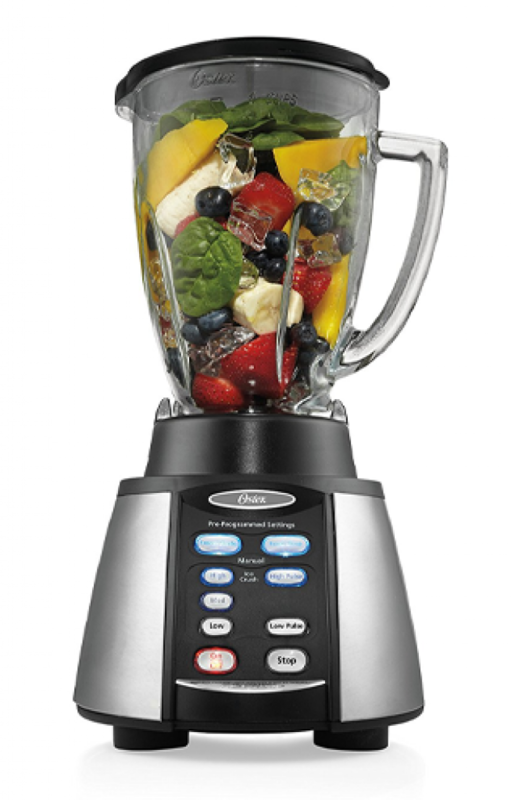 With brushed stainless steel and a black finish, you have a blender that offers 600 impressive watts of blending power. This gives you the ability to blend just about anything you can imagine in the way of drinks and smoothies. These blenders can create your recipes in just a matter of seconds. The Pre-Programmed Smart Settings feature allows you to use this electronic device without any trouble whatsoever. Dual-direction blades prevent jam-ups. 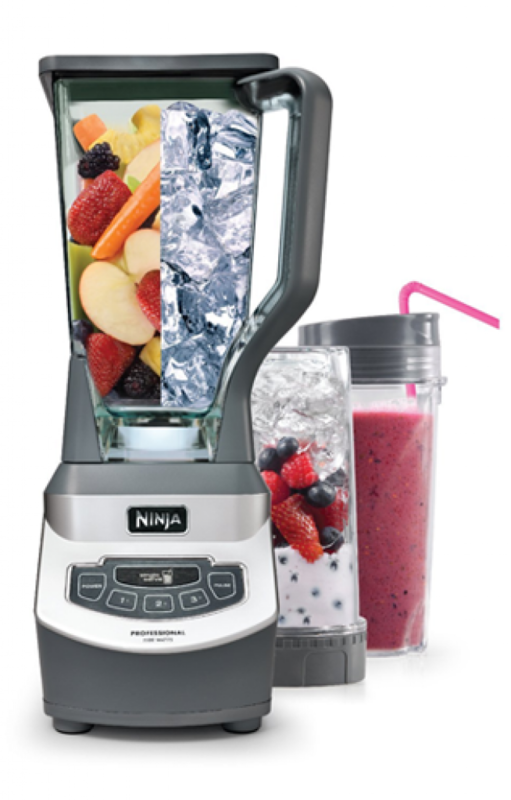 The Ninja Professional Blender with Nutri Ninja Cups is perfect for anyone who wants something a little different from their blender experience. 1100 watts of professional performance power is packed into this electronic device. You will also want to take note of the three speed options, in addition to the pulse and single-serve options. The 72oz Total Crushing Pitchers that are included with these blenders come with a couple of benefits. Most of all, you will have enough room to make large or small quantities of just about anything you can imagine. Includes two Nutri Ninja Cups with to-go lids. A market favorite, often touted as the professional’s choice for homeowners, Ninja has the right amount of power and weight ideal for the counter-top or the kitchen island. It has multiple blending speeds and can be cleaned easily in a dishwasher. There are several models available and there is definitely one just right for a homeowner’s budget. With juicing, it is often the Slow and Steady wins the race. Masticating juicers are the slowest of all types, ensuring highest efficiency, output albeit at a higher cost of ownership. If you decide to go with these types of juicers, you won’t be dissapointed. This monarch of the kitchen counter can make the ultimate smoothie. It can crush ice like a steamroller, and delivers top quality results without busting the budget. Hamilton blenders are fast but steady workhorses of the kitchen and dishwasher friendly. Above all, they are well balanced in their feature set, while being affordable. This blender can help a short order cook create masterpieces for the dining table in a jiffy. It is easy to clean and highly durable, lasting years longer than other brands. Vitamix has a reputation for being a heavy duty kitchen appliance that also happens to be easy to store. It does wonders with smoothies, peanut butter, and other scrumptious things. Staying healthy and losing a few pounds doesn’t always mean you have to eat or drink things you don’t like. We welcome you to the wonderful world of Juicers! With juicers, you can make some amazing and tasty smoothies and refreshing drinks you will love and still lose the weight! Check out our wight loss guides to learn more. Why Do You Need a High Quality Blender? 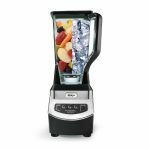 Shopping for a blender means diving deep into a world that features tons of brands, tons of models, and tons of options. When we shop for appliances, we inherently understand that we are going to get what we paid for. Even so, we want to try and get the best value possible. Sometimes, this means we wind up buying a blender that seems too good to be true. When this turns out to be the case, we feel as though we have wasted our time and money. You can avoid that by understanding the value of a high-quality blender. We aren’t saying that you have to buy the biggest and most expensive blender out there. In fact, you almost certainly shouldn’t do that. What we are saying is that with a little research, you can know what to look for. 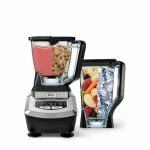 You will be able to find a blender that will meet all of your needs, and you will be able to find a blender that doesn’t break the bank either. The benefits of having a good blender in your home, or even in your place of business, are numerous. A high-quality blender can do it all: When you buy a good blender from a reliable brand name like Ninja or Vitamix, you should be getting something that will be able to handle a wide range of tasks. From blending fruits and veggies, to helping you create things like milkshakes, soups, or even salsas, a good blender will be able to handle just about anything you might have in mind. Nutritious food will be easier to take: Most of us could stand to eat healthier. Unfortunately, this is something that is often easier said than done. Thankfully, when you have a blender, you are going to find it much easier to get the fruits and vegetables you need from one day to the next. You are getting something that will last for years and years to come: If you buy the right blender, you can be certain that you will get something you can rely upon for a very long time. A blender can become a vital part of your kitchen, giving you years of successful use. A blender will come in various models and prices. Ideally you want to get the most value for your money and the best way to assure that is to understand what a blender can do. It often can happen that the customer either buys a very complicated blender that isn’t really needed or a very cheap appliance that doesn’t do everything desired. Crush ice into small chunks. Take solids such as spices and turn them into powder. Crush ice into such fine particles that the result can be made to smoothies. Various other things depending on the model. Given these control functions, one must then decide what is really needed and what is not essential. 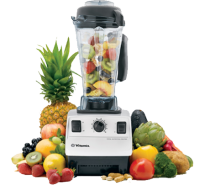 A top-of-the-line blender should be able to do all of the above, and a medium priced blender can do several but not all of what is listed. 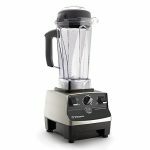 Taking a look at the description of the blender and what its controls are able to do can help you narrow down the selection. The jar is the most noticeable part of any blender. This is where the ice, the vegetables, and all other kinds of ingredients are put in order to be blended into a tasty smoothie or a delightful dish, ready to serve. Jars are not all the same and the type of jar can influence the price of the blender. The ordinary choices are between plastic and glass jar. A glass jar does not absorb food odor or get scratched the way a plastic jar does. Glass also cools drinks a lot faster than a plastic container and glass jars are dishwasher friendly. The plastic jar is lighter and doesn’t break as easily as a glass jar will. Moreover, plastic is less expensive but does the blending job just as well. A smart consumer is looking for the best possible deal when buying a blender. He or she wants to make certain of getting the best possible value. However, it is important to remember that sometimes the least expensive model may not be the best buy. It doesn’t hurt at all to take a look at the features of a given blender, and see what the enhancements can do. These features can be functions that are used for specific things such as great frozen drinks. The blades may be constructed in such a way to improve the flow into the blade and create a better blending. Some blenders have advanced technology that can better blend a variety of ingredients in one mixture. Others can simply have features that make it easier to clean the appliance after it has been used. Some blenders may be a little more expensive, but if they have the capacity to do the work of other kitchen appliances, they may be worth the price. Convenience and performance are two important qualities a blender should possess. Never hurts to pay a little extra for that much more! The jar of a blender is definitely the main attraction but at the heart lies the motor, a vital and influential component. The main reason why blenders have taken the place of elbow grease happens to be those small electric motors that can pack a lot of power. Think of them as the hundred yard dash of a track event. Blender motors provide short bursts of power but they can’t be used for extended periods. The power can range anywhere from 450 Watts to 750 Watts depending on the model. Speed can be changed, but lower power means slower speed. 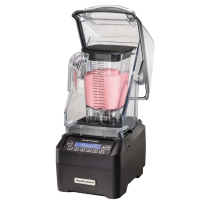 Blenders can have low, medium and high speeds and more sophisticated models can have additional settings. Speed is directly related to the wattage of power. The motors are designed to be used for short bursts of energy. Anything over one minute could cause serious strain on the motor. This is the muscle machine of blenders. The Ninja can pack up to 1000 W of power and pulverizes ice like a jackhammer. There is no need for you to chop up fruits and vegetables; the Ninja has the blade power to slice through an entire apple or squash without any problem. It is easy to clean, and its large jar is easy to pour from and can hold quite a bit of juice or smoothie. The Ninja is durable and can be used numerous times in a given day without breaking down. A good safety feature is that the Ninja container has to be locked before the power will begin. Because of its size, the Ninja will have to be stored in a cabinet that has a fair amount of height. Best for – All things frozen, including frozen vegetables. Ninja can handle large chunks of fruit or vegetables. Pros – Exceptionally good power and durability. Can handle a large volume of items to the blended. Excellent for parties or the occasions. Cons – The Ninja is not really a kid friendly appliance because the blades. Smoothies can have a little bit of grit in the texture, which may be the result of the design of the blades. 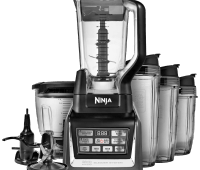 Read Our Reviews On Ninja Blenders! 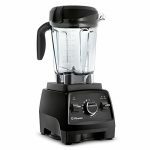 This blender is darn near unbreakable with a 64 ounce polycarbonate container and stainless steel blades. The motor is definitely built for work with two speed control and solid horsepower. The blades are so reliable they can be used to grind flour as well as make ice cream and wonderful smoothies. Vitamix comes in one piece so there’s no problem with assembling or disassembling the appliance. You’ll discover this blender is very easy to use and has a lifetime durability of well over five years. The Vitamix is easy to clean and can handle being used often in a given day. 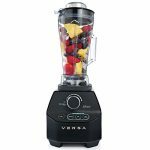 It has the ability to blend very smoothly all types of fruits and vegetables for family meals or special parties. Best for – Making ice cream and slicing through frozen fruit. Pros – Amazing durability. The Vitamix can last for up to seven years or more and it comes with a good warranty. It is a great blender for anyone does a lot of blending as a daily kitchen routine. Cons – Noisy because of its heavy rotating machinery. Read Our Reviews On Vitamix Blenders! Best for – Use at parties with its large capacity. Pros – The size of the jar and the ice crushing capability. Cons – The size the jar may be too large for the use of some people. Read Our Reviews On KitchenAid Blenders! This isn’t an ordinary blender; it’s a hybrid that combines blender and food processor capabilities. Blades are made of stainless steel and can do the job is no trouble at all. A reversible disc function means no place to hide for any food or ice placed in the jar. Problems resulting from any wobble are reduced by the rubber soles that keep the blender stable on the counter. The Oster is a lean, mean, ice crushing machine and can handle thick ice and anything else that is a little more solid than normal. It has a food processor attachment that can do a high quality where the owner needs it. You’ll find this is an excellent blender to use for making any mixed drinks. Best for – Mixing drinks and doing a complete job of processing any food placed in the jar. Pros – The reversible disc function and the blades. Cons – It can be a bit noisy. 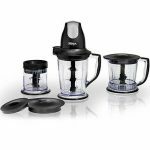 Read Our Reviews On Oster Blenders! These blenders are perfect for those people who are extremely busy. Hamilton Beach has single serve blenders that use the jar as a drinking cup, but there are also standard blenders as well. 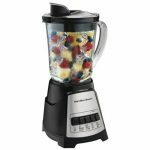 The Hamilton Beach blender is fantastic if you want a great smoothie and the jar can hold up to 5 cups of the delicious drink. 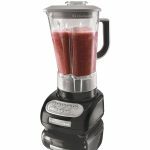 The blender has a powerful motor is able to handle all types of food preparation including purée and making milkshakes. 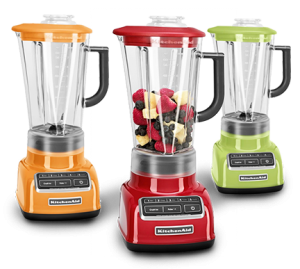 The Hamilton Beach blender uses Wave – Action to bring the contents down into the stainless steel blades of the blender. This guarantees you will find no chunks of ice or food matter when the blending is done. It comes with a three-year warranty and the jar is dishwasher friendly. Pros – these blenders are very easy to use and cleaning is never a problem. Wave-Action draws the contents to be blended down into the blades, so there’s nothing floating on top after the blending is done. Cons – there is some difficulty with processing large chunks of ice, requiring ice to be broken prior to being put in the jar. The powerful motor can be just a little bit noisy. Read Our Reviews On Hamilton Beach Blenders! An entirely different breed, immersion blenders are held by hand and allow for greater creativity in the kitchen. They are very easy to use and extremely easy to clean; they can be rinsed in the sink most of the time. Nowhere near as massive as traditional blenders, you will use one like a third hand and it will allow you to create tasty wonders like a top star chef. They are incredibly easy to store. Immersion Blenders are excellent for making dessert frostings, milkshakes, and mashed potatoes among other delicious kitchen creations. Best for – Soups, salad dressings, dessert frostings. As a matter fact, immersion blenders are exactly what a baker would want to have in the kitchen. Baking batters are easily blended with these little helpers. Pros – Easier to use than heavy traditional blenders. Immersion blenders follow the cook. They are very easy to store. Cons – Immersion blenders are not as durable as the standard blenders. They are also not very good with crushing ice. Read Our Reviews On Immersion Blenders!